Hi readers, I only found out about this today.......Ajax is celebrating their first Caribbean day. So if you're out in the Durham region show some support for your Culture!!!! 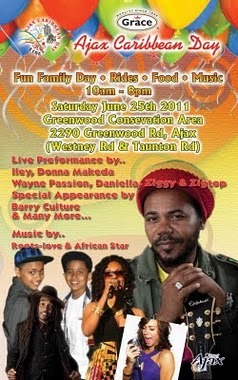 Ajax, ON-Inaugural Ajax Caribbean Day celebrations will kick off on Saturday, June 25, 2011 from 10:00 AM to 8:00 PM. The first Annual Ajax Caribbean Day will be held in the beautiful Greenwood Conservation Area nestled in the heart of Ajax. The day's activities are geared towards the entire family. There will be rides for the children, musical entertainment and delicious Caribbean food. The organizers of the first Ajax Caribbean Day have scheduled a program that will surely appeal to all members of the Caribbean Diaspora and community residents who are interested in taking a trip around the region without ever leaving their community. The line-up for the day long action packed entertainment schedule includes Iley Dread,who is currently holding the #1 single on the Richie B charts for 2 weeks. Toronto's own female reggae icon and DJ Donna Makeda, emerging female artiste Daniella, Ziggy Zigtop the energetic duo, and you can expect special appearances by Barry Culture and many more. Your MC's for the Ajax Caribbean Day will be DJ Cool from Soundfm.ca, Judy British fromrealreggaeradio.com, J-Nice of CHRY, and Wayne Passion from Canada's new webisode series Reggae Kitchen. Admission to the event is $5.00 and children under age of 10 are free. Tickets are available at various outlets in Ajax and online for your convenience.